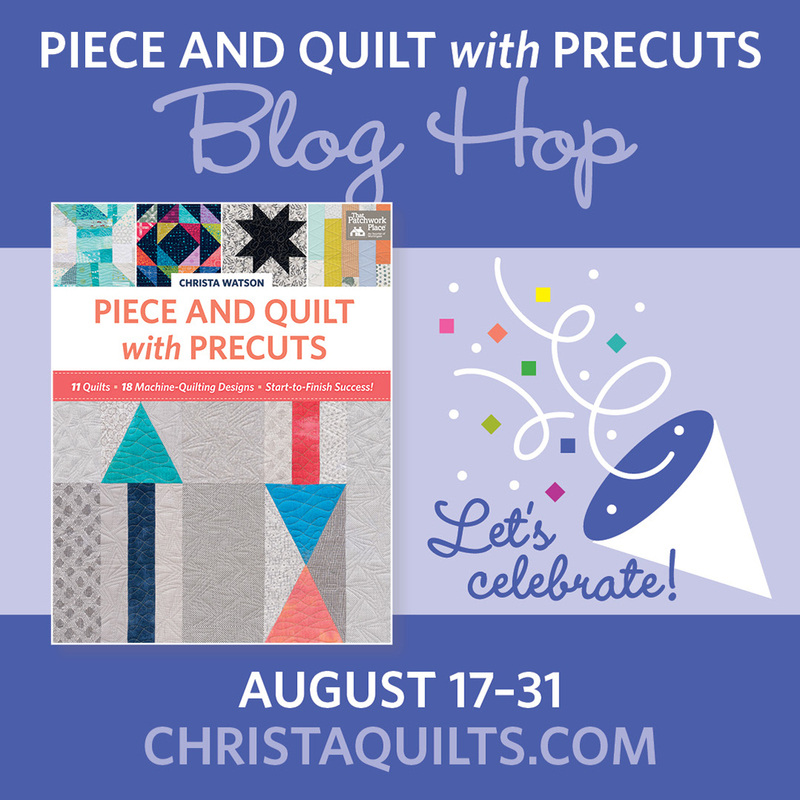 Welcome to my stop on the Piece and Quilt with Precuts blog hop! 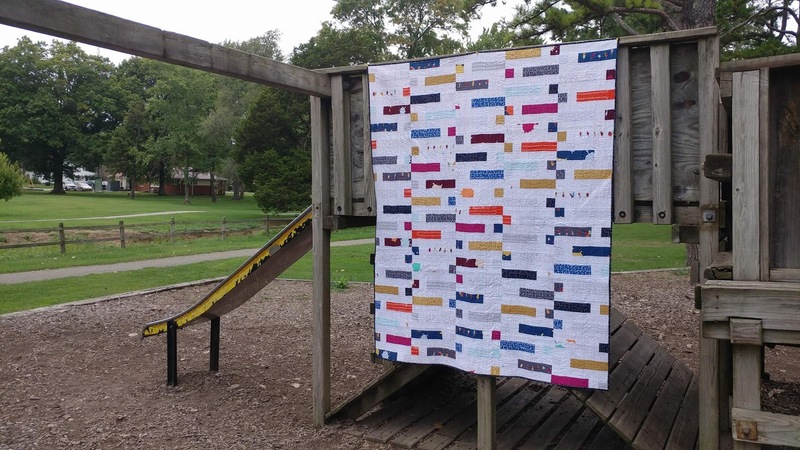 There have already been some really great quilts made so far, and even more are coming! Be sure to visit all the stops on the hop, as there are giveaways galore! I am excited to be able to share with you my version of Dot 'n' Dash from Christa Watson's latest book, Piece and Quilt with Precuts! I was immediately drawn to Dot 'n' Dash for its light background fabric that allows the colorful print fabrics to be the star of the show. Even though the pattern appears simple, there is so much movement within the design. I knew right away I wanted to make this quilt! Christa's Dot 'n' Dash quilt from the book, Piece and Quilt with Precuts (photo credit: Martingale). For my version of the Dot 'n' Dash quilt, I started with a fat quarter bundle of Double Dutch fabric by Latifah Saafir Studios for Me + You Fabrics by Hoffman Fabrics that I got at Sample Spree at spring Quilt Market. I've been saving the fabric for the perfect project, and this was it! Christa's pattern calls for a jelly roll of print fabrics and a jelly roll of background fabric. 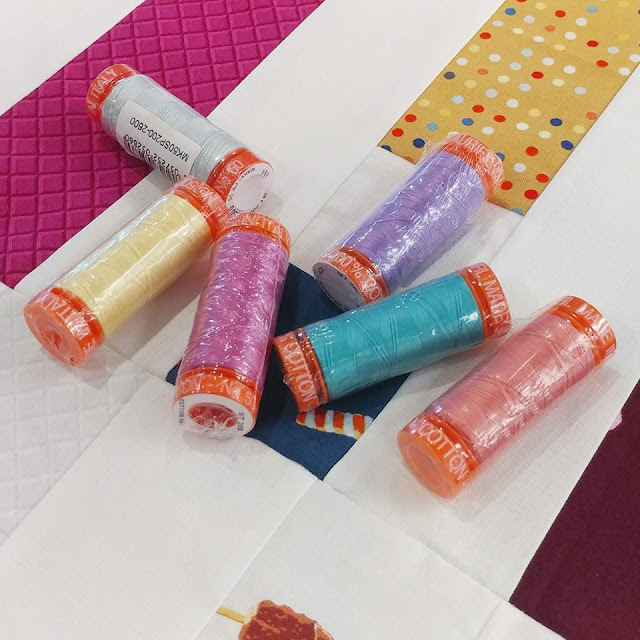 Although the jelly rolls would definitely save time cutting, I was able to use the Double Dutch fat quarter bundle with quite a bit left over (that I used to make the quilt back!). I made the entire quilt top and quilted it at the sewing retreat I went to last month! It felt so good to make a whole quilt in a weekend! When deciding on what thread to use for quilting, I immediately wanted to use white! But every single other person at the retreat said I should use color! I'm not sure why, but color is so hard for me to use! 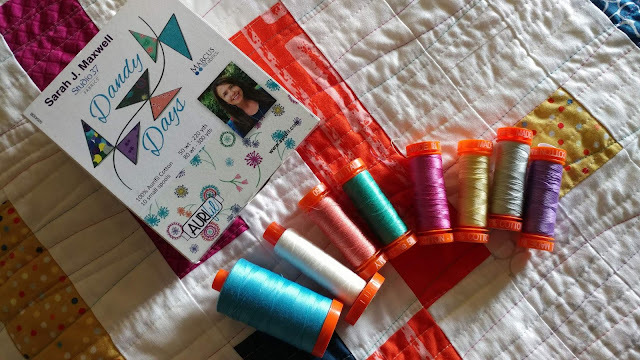 I grabbed my Aurifil Dandy Days thread collection by Sarah Maxwell, and was excited that all the colors coordinated perfectly with the Double Dutch line! I decided if I wasn't going to use white, then I'd use ALL the colors! For quilting, I wanted to try Christa's "Squiggles" design. It is made using a walking foot, but is organic and random. I always quilt using even spacing and plan out my designs. The idea of random and unplanned was a little scary - but I like trying new things! In the Piece and Quilt with Precuts book, Christa explains exactly how to do all the quilting designs she used for each quilt. It's easy to mix and match designs, and her thorough instruction for each design gave me the confidence to try something new (and a little scary)! Once I had gone through all the colors, I decided I wanted more texture, but not necessarily more color. I decided the best way to do this was to use - white! I added more quilting until the spacing between lines was about 1/4" to 1/2" across the whole quilt. The texture this created is SO great! I'm so glad I trusted Christa's process! I will definitely be using this quilting design again! 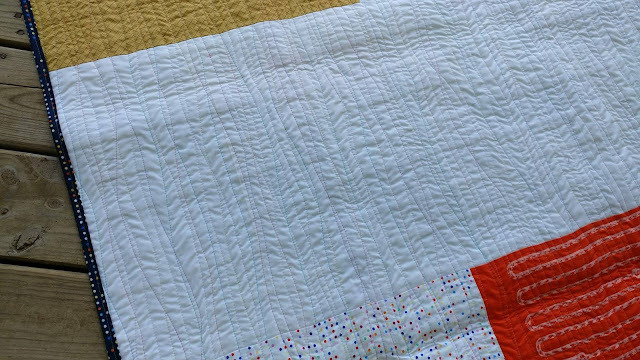 Once quilted, I bound the quilt using the blue dot print from the Double Dutch line. The dark color provides a nice frame for the quilt, and it has all the colors that I used for quilting. For the quilt back, I sewed all the leftover pieces from the fat quarter bundle together. I added a strip of white fabric in order to get the size I needed. I love this part of the quilt! I love how the quilting lines and texture really show up on this section when looking at the back of the quilt! In the end, I love this quilt! The Double Dutch fabric paired with the crisp white background fabric, the quilt design and layout that has enough interest to keep your eye moving when you look at it, and the texture of the quilting all work together to make this quilt my current favorite! Christa's new book is a perfect addition to my quilting book library! The patterns all use precuts, but are easily made with yardage or scraps too. She walks you through all the quilting designs she used on each quilt, so "quilt as desired" isn't a mystery any more! I have quite a few pages already bookmarked for using soon! 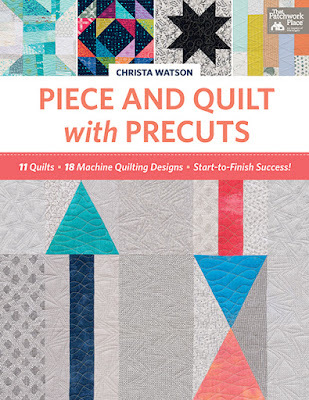 Cover of Piece and Quilt with Precuts by Christa Watson (photo credit: Martingale). 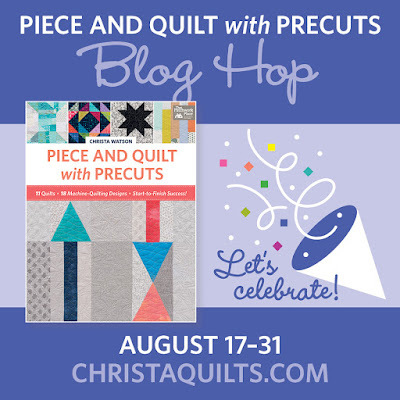 Would you like to win your own copy of Christa's new Piece and Quilt with Precuts book? Martingale is generously providing an e-copy of the book as a giveaway on my blog! To enter, just leave a comment letting me know what your favorite precut is! (Giveaway ends August 30th.) Giveaway closed. Piece and Quilt with Precuts is available on Amazon, from Martingale, and also directly from Christa (she'll sign it for you too!). Be sure to visit Christa's blog for another giveaway, and all the stops on the blog hop to enter to win some other great prizes too! 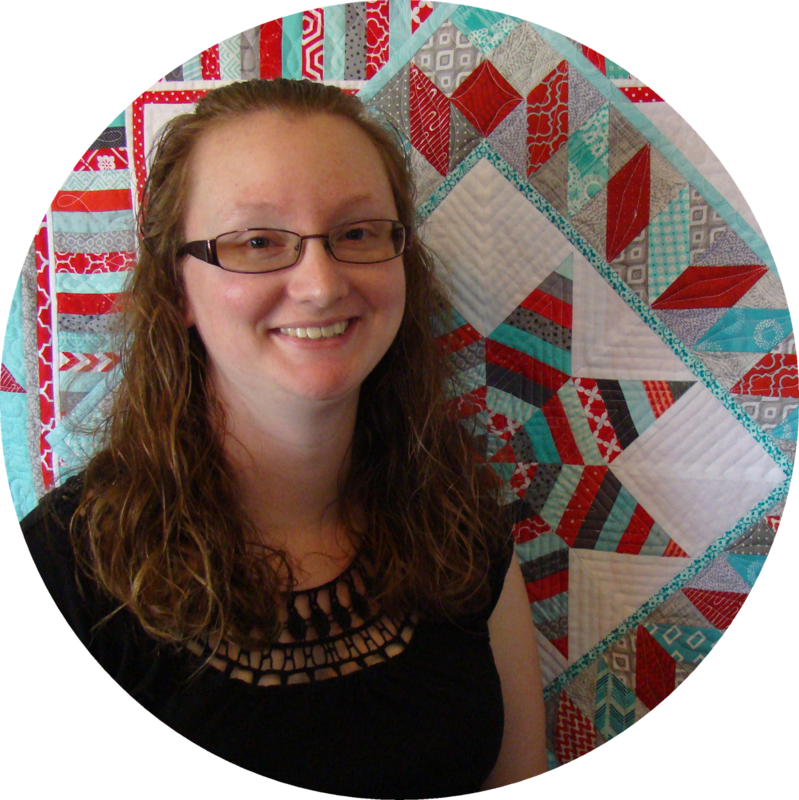 Laura Piland Blog: Slice of Pi Quilts IG: @sliceofpiquilts <----------------- That's me! Thanks for stopping by! You can keep up with my latest shenanigans by following me on Instagram or Facebook. Be the first to know about my quilt finishes by following my blog (I recommend Bloglovin'). Happy quilting! Linking up with Linky Tuesday at Freemotion by the River, Wednesday Wait Loss at The Inquiring Quilter, Let's Bee Social at Sew Fresh Quilts, Midweek Makers at Quilt Fabrication, Needle and Thread Thursday at My Quilt Infatuation, Finished or Not Friday at Busy Hands Quilts, Can I Get a Whoop Whoop? at Confessions of a Fabric Addict, and TGIFF at Anja Quilts. I've said it before, and I'll say it again ... I absolutely love that quilt! Your mixture of color and low volume prints is absolutely perfect. 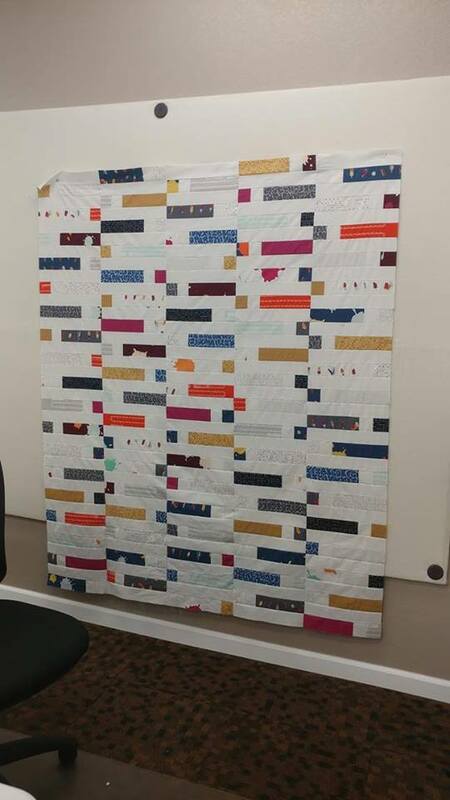 Congrats to being brave to use colored threads for the quilting, I think it looks wonderful! Your quilt is gorgeous! My favorite precut is fat quarters. Love your quilt and it's reversible. I already ordered the book and can't wait to receive it. I normally shy away from using white fabric but I really like it on your quilt. I really like charm squares. Great for little projects. 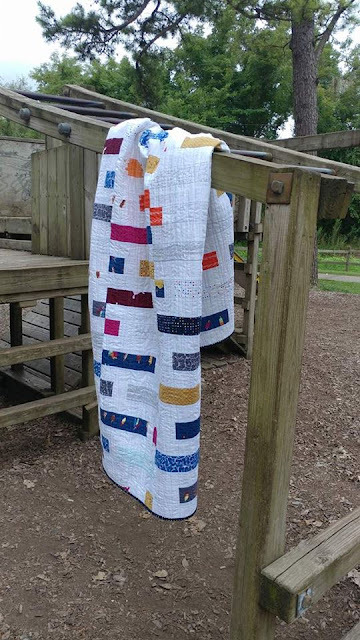 Thanks for sharing your beautiful quilt and the giveaway. I love the wavy quilting you chose as well as the colors you used. My favorite precuts are probably layer cakes, although I like them all. This is a perfect quilt, especially since I am a white user. I love it, the quilting and the fabrics. The nulti color quilting really works, I would have never been brave enough to try them all, but good job. Forgot to add I like layer cakes and jelly rolls. Oooooh!! I love your quilt and the quilting with different coloured threads is perfect!!! My favourite precut is FQ bundles!! I love fat quarters because they have larger areas to use for non quilt projects. Beautiful version of the pattern, I love the prints you used! The quilting is great with all of the different colors. Awesome quilt. 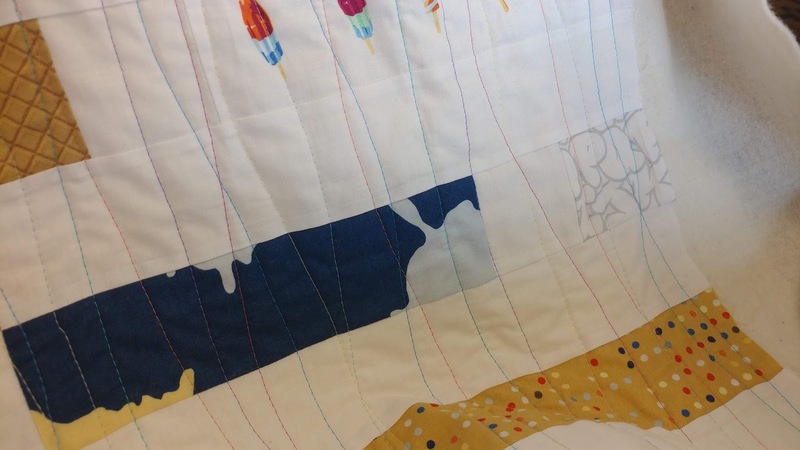 Love the colored threads and squiggle design used in quilting. I think fat quarters are my fave pre-cut because they are so versatile. This turned out so fantastic! I love how you used all of the threads for quilting and the texture is so yummy!! I've used a lot of charm squares in my time, with a few more still in my stash. I love your fabric choice for this quilt. The random number generator picked you as the winner! Check your email! I like to make baby/child quilts so charms are my favorite precut. 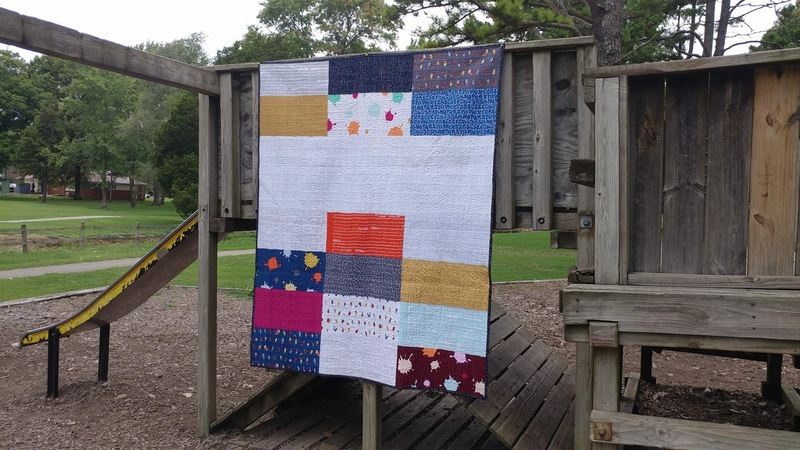 Love how you used a variety of threads to FMQ the Dot 'n' Dash quilt....Clever! 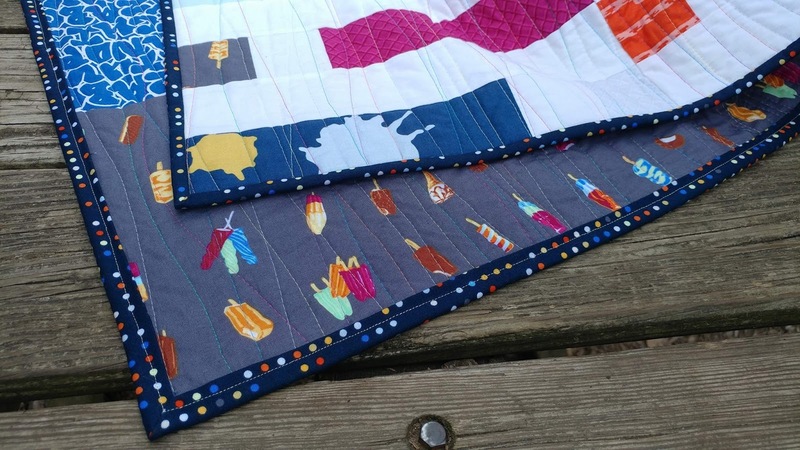 Using the Double Dutch fabric was a perfect choice for this quilt! It's great to break out of our box to try something new like the Squiggles quilting, isn't it? Choosing the Dandy Days threads was perfect too! I like the white squiggles mixed in...so good! I love a great jelly roll to sew with. It's quick and ready to use! I love your quilt! And how exciting to get to be part of Christa's blog hop!! That's amazing to make a quilt from start to finish in a long weekend. I LOVE the quilting. It was interesting to see all the in progress shots of that. The first couple pictures where there wasn't very much quilting made me think it wasn't going to look very good (other than having already seen all of the quilting above that!). Then as you added more, it just kept looking better and better! I really like the idea of using the different thread colors, and then filling in the rest of the texture with white. It turned out fabulously! Also, I really like your photo shoot. I know how much time that adds to making a blog post, but the pictures are wonderful. My favorite precut is fat quarters... but I have my first set of layer cakes and I'm looking forward to experimenting with them. I love your version of this quilt! Thanks for sharing your story about the quilting. It was so inspiring. Good for you for taking a chance! It came out really well! I love how you quilted that beautiful quilt! The colors are so fun! My favorite precut has been fat quarters but I have come to really love using layer cakes lately. Really all are fun to use! Love your version of this quilt. My favorite precuts are fat quarters. I really like jelly rolls the best but I buy all of them. Nice quilting and great quilt, love the colors. Fat quarters always give me the most options but right now I seem to like layer cakes best. Love the way the wavy quilting works on this quilt. 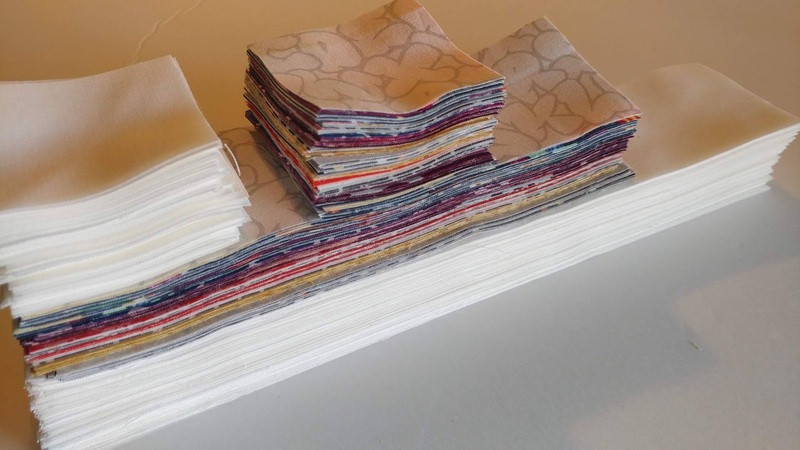 I like fat quarters followed by layer cakes....love how your quilt turned out!!! Fat quarters are my go-to as I like to prewash. 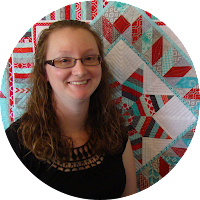 Thanks for sharing your how to quilt deliberations. Your quilt turned out great and I really like the subtle, yet distinct, coloured quilting. Well done. I don't buy anything smaller than a fat quarter. I have won a couple of bundles of fat eighths but haven't used them yet. The quilt is stunning, thanks for sharing your free of wavy quilting and how you conquered it. I usually buy fabric by the yard as I am worried that I will run out of what I need. Yes the I end up with a lot of left overs, which are great for quilt like this. Fat quarters are my choice. You get a variety of cuts from them, and they don't take up much room. My favorite precuts are fat quarters. I love the versatility of that size. I love your *beautiful* quilt, Laura! Laura, *thank you! * for sharing your beautiful quilt, and your process!! I do SO appreciate when makers share their creative process journey! It would be cool to add triangular points to all the long strips to look like pencils. The thumbnail photo almost looks like that. I love just about all the pre-cuts, but I really love the versatility of layer cakes! I love your quilt! I usually prefer fat quarters but have a few jelly rolls that need to be used! Love your use of white as a neutral on your quilt. I like fat quarter bundles when I can afford them. Have also been using a lot of 10" squares lately. 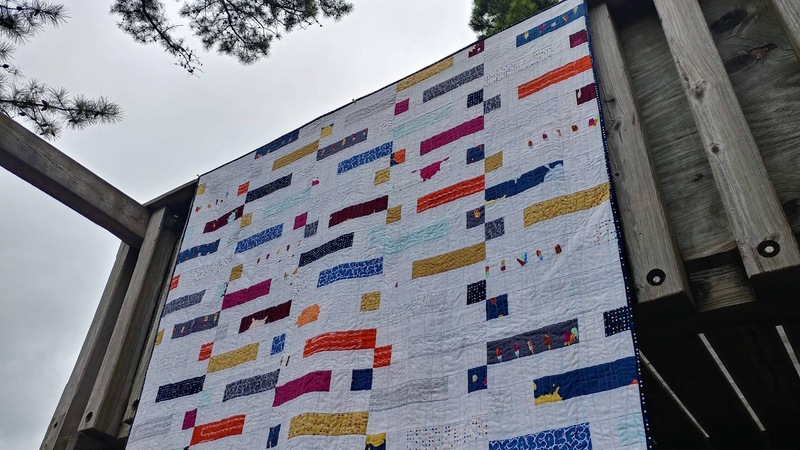 Love the way you quilted this quilt! Great finish. I love the quilt, and the way you quilted it. I think my favorite pretty cut would be fat quarters. Beautiful quilt. I have a hard time picking a favorite precut, but I'd probably say a layer cake. I think I like either fat quarters or charm packs. Of course with fat quarters you have a lot of versatility but I also like that with charms you have to sometimes be a little more creative to bring something all together. 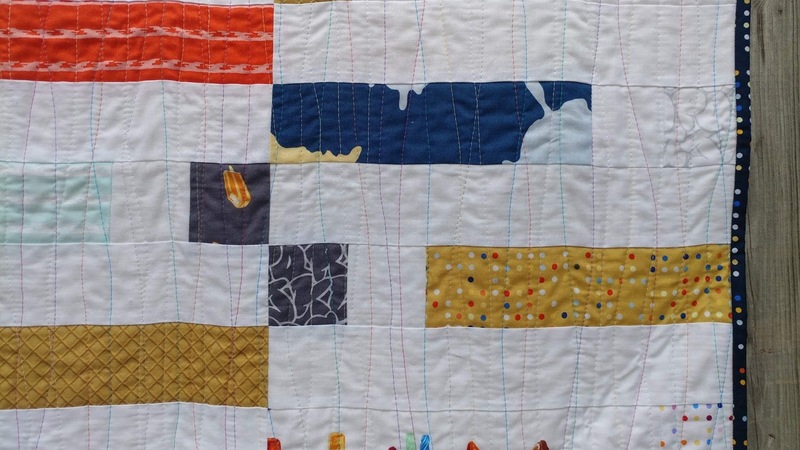 I really like your multiple thread colors in you quilting. The quilt turned out great. Thanks for sharing the giveaway. What a great choice of quilting...all those colors are fabulous! Great quilt! I like using fat quarter bundles and layer cakes. Lovely quilt! I like fat quarters the most! This is a great quilt! So pretty, and the quilting!!! Love it all. I'm new to quilting but am a big fan of fat quarters so far! Looks and sounds like you had so much fun making this quilt. It is really lively and has great character! I don't know if you call fat quarters precuts or not. But I do like bigger pieces of fabrics, tho have had some fun with jelly rolls. I've bought a layer cake but haven't used it yet. This quilt is beautiful, love all the colors!! I love all the pre-cuts, but I think my favorite is fat quarters. I love the quilting in different colors! I love precuts. I think I'd choose layer cakes as my favorite. 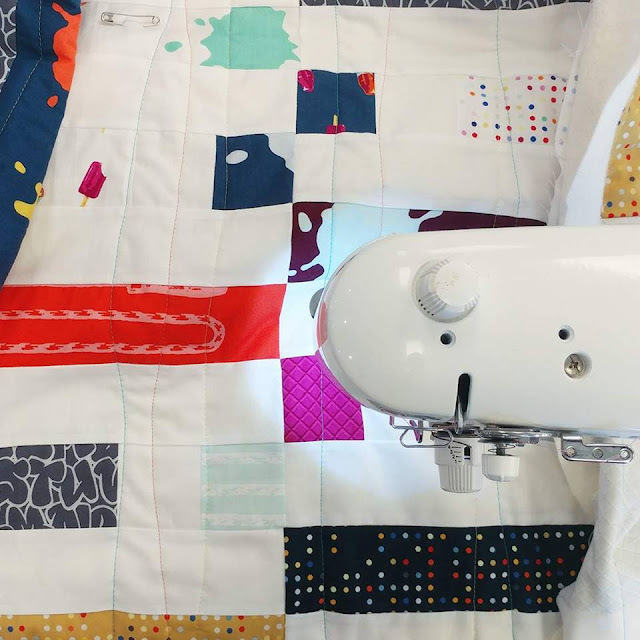 Love the colors and quilting on your quilt! My favorite pre-cut is fat quarters. 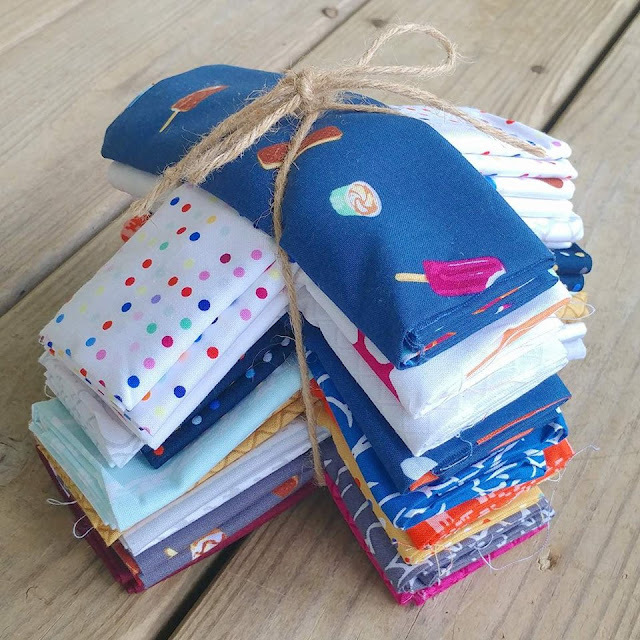 I love them all but I think fat quarters are the most versatile! Love layer cakes too! my favorite precut would be jelly rolls. I've bought layer cake but haven't used yet. I love your blog and the ideas you come up with for the fabrics. My favorite precut are jelly rolls - lots of fun and quick patterns available! Nice quilt! Love that you were able to finish it in a weekend. I like fat quarter bundles. Jelly rolls are my favorite. Your quilting looks great--I want to try that. I'm in love with this quilt you made and especially the backing. I've o my been quilting for a little over a year now and have normally bought fat quarters but I'm starting to realize I don't have enough when I want to make a quult so I'm ramping it up and getting 1/2 yards. I also love scraps. This week it's charm squares! Working on a 'new'scrap quilt. My favorite is charm squares as I like to make scrap quilts to the many variety of fabrics the better. 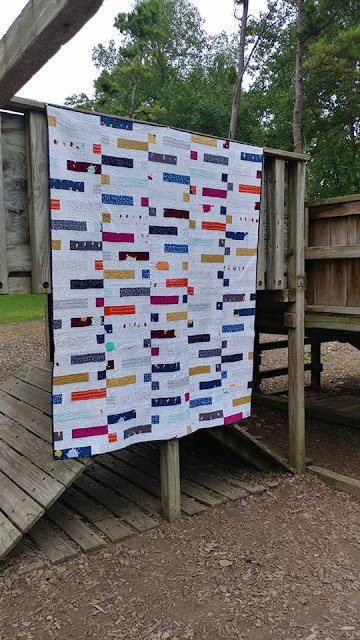 Another gorgeous quilt, Laura! I use charm squares for fast little quilts and projects, mostly just to get the satisfaction of getting something done. My favorite precut is probably charm packs. You can do so much with them! Lovely quilt. Christa is such an awesome quilter! Thanks for linking up to Wednesday Wait Loss. Great quilt! Guess my favorite precut is 5in squares. Thanks for sharing this hop! I like your quilt. How great that you could sew up the top and quilt the whole big thing in one weekend. Awesome. I love fat quarters. They give me just enough yardage that I feel like I can use them in multiple projects and cut many different sized pieces. I seldom buy fabric with a plan in mind, so bigger pieces are better to give me options. So fat quarters are my favorite. But if I don't want to spend big dollars, a layer cake or charm pack can be a good way to sample a fabric line. Love your version of that pattern! And your quilting is smashing!!!! My favorite pre-cuts are jelly rolls. I love FQs becuase they are so flexible, but charm packs are so cute (and affordable!). I need this book- it's going on my holiday wish list (if I don't win, of course!). The words "quilt as desired" are the bane of my existence, lol! What a quick and easy pattern. Love the quilting you did on it. Let's see my favorite precuts: FQ, jelly rolls and charm, both 5" and 2.5". The Dot and Dash quilt was one of my favorites when I first looked through the book. I have it tagged to use up a lot of my scraps. Your version is delightful. I don't buy many precuts, but I did get some charm packs when they first appeared. I love fat quarter towers. Your quilt is great! Love your colors and the low volume. I need to make one. I love all the precuts - lots of good patterns exist for them. Guess I like fat quarters best. 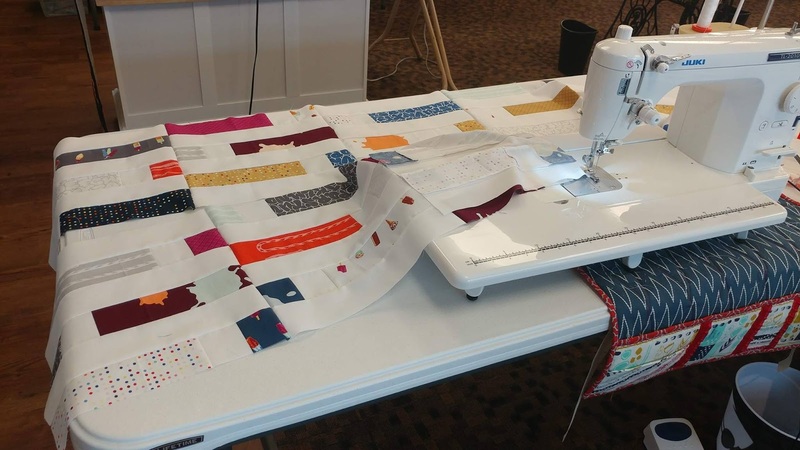 Thanks so much for sharing your quilt making process with us - as a beginning quilter it's so helpful to see and hear/read a quilter actually making the quilt. I really loved how your quilt turned out - it's beautiful. The binding you chose was the perfect finishing touch. My favorite pre-cut would have to be fat quarters just because they are so darn versatile - you can cut strips, squares of many sizes or a combination(s). I think my fav must be layer cakes because I get at least one of every print yet they're big enough to see even a larger motif. Fat quarters used to be my favorite pre cut (I have an astonishing collection), now I collect them all :) Love your quilt! Fat quarters are my favorite pre-cut. I really like your organic multi-colored line quilting. I've bought a Kindle copy already - couldn't wait to read it. I'll get a book copy later, too. I really like your quilt, and the way you quilted it is great. Turned out really well! Thanks for the look at what you did! I really like fat quarters. It's good to see how pretty your quilt is with different color thread. I always have trouble choosing thread color. Reversible - how awesome!! Thank you for sharing the "how to"! My favorite precut are layer cakes! Like you, I always quilt with white (or light gray) thread. Your friends were correct and the colorful quilting is just perfect here. How nice that you had all the thread on hand! My new favorite pre-cuts are fat eighths. I have way too many fat quarters and I can't quite stop buying them. Your quilt is fantastic. I love the colors you used to quilt it. Great job on your quilt--love the colorful quilting! My favorite precuts are fat quarters. I really love that quilt. 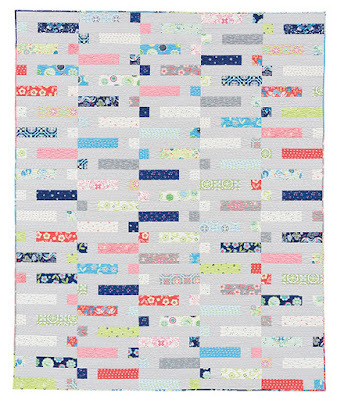 One of my goals this year is to make baby quilts and put them away for my youngest nieces when they become moms. I'm going to order this pattern! I usually use charm packs when I use pre-cuts. So many uses for them! What a great quilt! and I love your quilting! What a stunning quilt with such vibrant cokirs! I like fat quarters myself. So versatile and a better value. My favorite is the jelly roll precut. There's so many patterns and options you can do with it. I love the quilting on this one, too, and am sure I could actually do a whole quilt myself with this type of quilting. 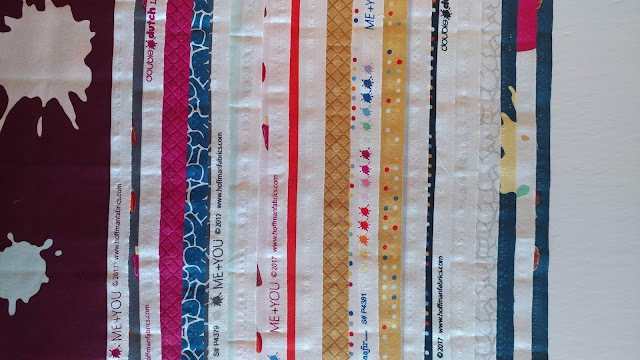 My favorite precut is the jelly roll! I'm addicted to them lol. Love your quilt love quilt, especially the quilting! Jelly rolls are my fave pre cuts because I am a lousy cutter! That popsicle fabric is to die for! Great finish. I love that you quilted it in various colours. Thanks for linking up with TGIFF. Fabulous quilt! Love the fabric you chose, really fun. 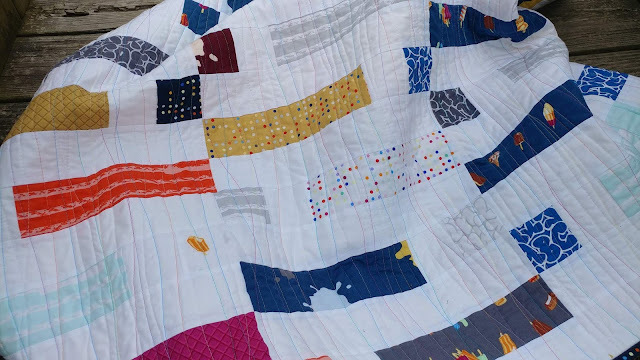 Thank you for describing your quilting, I too am nervous using colour but reading your post may have to give it a try. 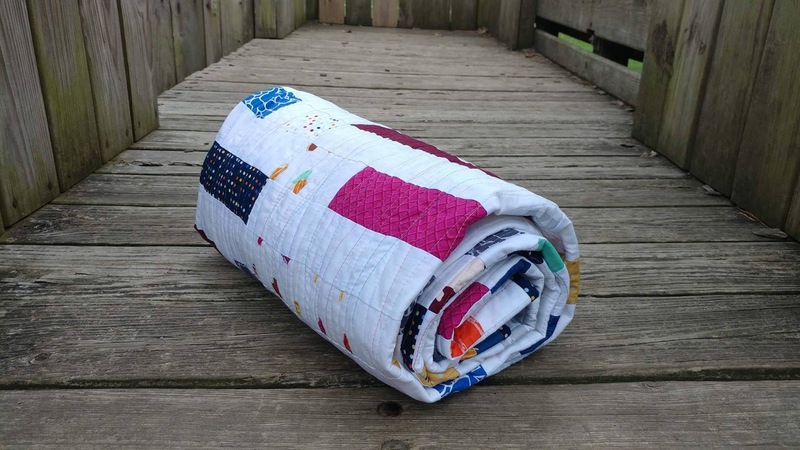 Such a fun quilt for jelly rolls. 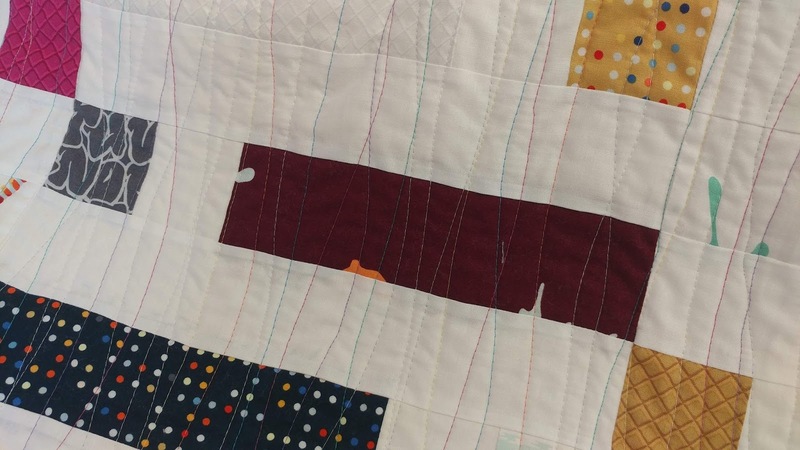 I never thought to use multiple colors when using wavy lines for quilting. I definitely will have to give this a try.